TimberScan is the leading application designed exclusively for Sage 300 CRE. The brochure design with its bold use of color, was designed to reinforce the company’s brand along with TimberScan’s technical advantages. 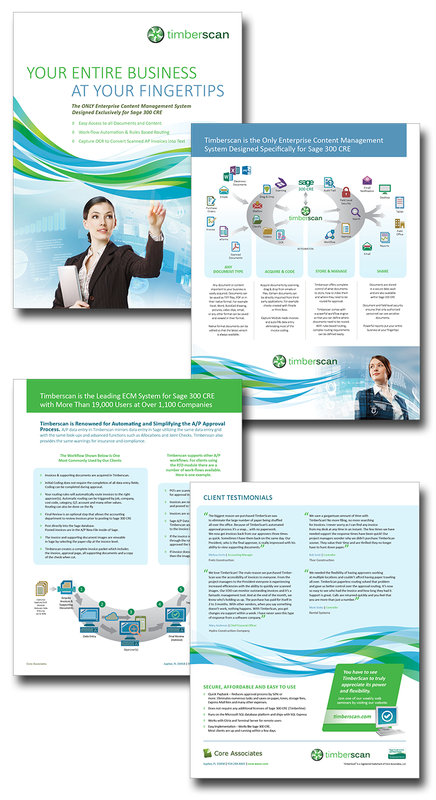 The inside details the software’s process and ease-of-use with 2 infographic diagrams. Brand looking a little rough and spotty? We’re not talking Tide detergent here. Logo look like something from the 1950s? Nothing says a tired company as an outdated logo. Creativity looking like something a teenager came up with? Sure, he was cheap but do you want your company to look like it? Marketing materials looking unfocused with no continuity? Prospects lose interest if they can’t figure it out right away. Presentations boring and long-winded? Nothing puts an audience to sleep like a dull presentation. Is your competition’s brand as poorly focused and outdated as yours? Better hope so because if not, you’ve already lost the game! That’s where a brand audit comes in! It’s the best tool most companies need without even realizing it! 1. What are you saying? 2. What are customers saying? 3. What is the competition saying? Auditing a brand means discovering the reputation that you already have—the perks, the pitfalls, and the competition. The audit process illuminates brand equity and liabilities so you can know what people are really saying when you’re not in the room. In today’s crowded and volatile marketplaces, branding provides quick recognition and quality assurance to potential customers. It is as important as money in the bank, Indeed, the visual elements that identify an organizations brand are always among its most valuable assets. Make sure yours is the best it can be! What are the audit advantages? An audit's advantages are three-fold—in savings, impact, and planning. Savings because it uncovers items no longer effective....Impact by pointing out small changes that can produce big results...and Planning because it provides awareness and a roadmap to the first step in deciding what should be. Many small and mid-size companies don’t have the time or resources to investigate how consistent and well branded their materials are. For larger companies, particularly divisions of still larger ones, an audit is a way to ensure that branding guidelines are being followed. 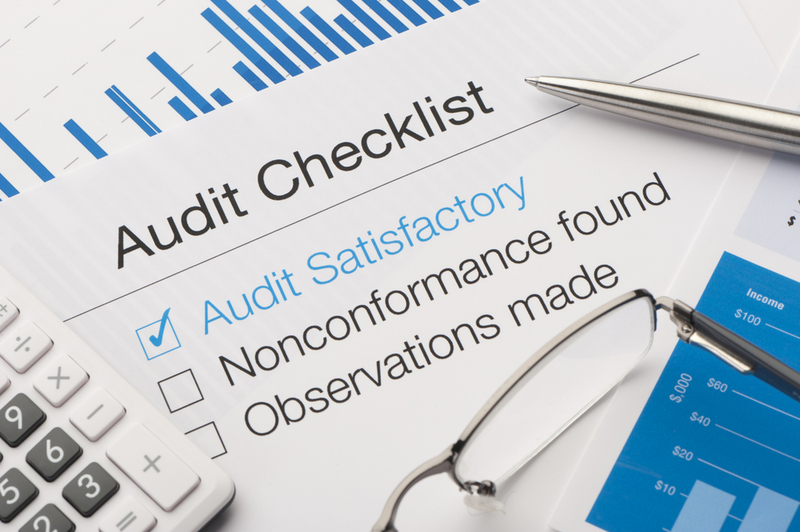 What does an audit uncover? An audit uncovers the greatness already present inside an organization, though it may be hiding or lost amidst the noise. Sifting through all past and present marketing materials to better grasp exactly how you’ve positioned your brand to date is an essential step in the process. Lastly, the audit examines the competitive market to see what the other guys are doing in your field. This comprehensive process provides a clear scope of your brand’s existing reputation—its best and worst sides, and everything in between. Bull's-Eye just completed a logo redesign and trade show booth graphic project for Himex. The company, based out of Scottsdale, Arizona develops usage-based insurance software for corporate fleet management programs. Himex contracted with Bull’s-Eye to work on its ICE (Intelligent Claims Environment) product. ICE modernizes the property and casualty claim handling process by leveraging proprietary connected vehicle technology to compress the claim lifecycle, including automated crash detection and notification. The current ICE logo was dated, child-like and gave a poor first-impression of this state-of-the-art product and its parent company. Bull’s-Eye redeveloped the logo and corresponding trade show graphic to be modern, clean, and professional while representing the advanced technology of ICE. Bull's-Eye Partners with AIGA for 20 years! When this computer systems integration company, Perfect Affinity, wanted a new brand identity, they were looking for something that convened that they helped "get networks together". Bull's-Eye evaluated the current brand, gave recommendations for improvement and then developed one that better fit the new direction. Using abstract arrows, the new brand mark conveys this subtle message of coming together with four arrows intersecting. The rebranded identity was used for stationary, brochures, advertising, promotional items and trade show presence. When this communication software company wanted to expand its business into a new direction, the company's marketing manager realized she needed to update it's brand identity. Bull's-Eye evaluated the current brand, gave recommendations for improvement and then developed one that better fit the new direction. The result is a modern "Miro" spiral representing the software's ability to integrate voice, data, e-mail and fax into one application. Complete materials for SGRA (South Georgia Radiology Associates) new marketing collateral package. Includes: pocket-folder, letterhead, envelopes, mailing label and brochure. Up popped the new Windows 8 logo this weekend. Reviews have been notably negative. Critiques have pointed out numerous problems with the redesign. Some are fact based others a matter of opinion. This reinterpretation of Windows pervious logo shows a bigger issue though than first meets the eye....Microsoft just doesn’t get it. Chasing Apple’s simple elegance and cool factor is futile. The new logo is very simplistic. This is a good thing. I’m pleased to see the tied turning toward more straightforward approaches rather than the rampant overuse of gradient blends to hide a boring idea. Simplicity works when based on a clever concept. This is the same idea which wasn’t that clever to begin with. Apple’s logo is based on a clever concept hatched in the 80‘s that works to this very day. One color approaches are all the rage. Gone are the days of the multi-colored everything but the kitchen sink color palette. Here again simple is better. But is this too simple and not any better? Does this one color illustrate Microsoft’s ho-hum corporate culture and product? Something bolder and daring might have been in order. A typeface sets the tone for a logo. This new typeface is rather staid and boring. Sure, Helvetica has had a resurgence in the current simplistic movement but is something similar to it right for a new software product? I think not. A typeface with a bit more movement and action would have been better. Moving into the future not stuck in the past. Microsoft is trying so hard to be cool like Apple. But as we all know, when you try too hard you often fail. The cool kids don’t try to be cool....they just are. What Makes A Great Brand Mark? A brand mark, or logo, is a company’s central graphic identifier. It gives visual indication in the marketplace as to what product or service the buyer can receive from the supplier. What are some of the common denominators of a great mark? Simplicity is paramount. A streamlined and concise graphic image gives the company immediate identification and recognition to the prospect. An overly complex design gives a muddled impression. Instant assimilation is vital. Adaptability is another consideration in developing a mark. How adaptable is it to multiple marketing channels? Does it work as well on a cell phone as on a billboard? Most marks require numerous versions to accommodate the wide array of marketing mediums available today. Keep up to date with a modern mark. Contrary to popular belief, a great mark does not last forever. Current trends and styles play an important part in keeping a mark fresh and relevant. Keep up to date with a modern mark. A great brand mark serves its company well. Create instant recognition and branding value with a mark that is distinctive, current and adaptable. Bull's-Eye created a dynamic logo which was incorporated into the lobby signage of the new Disc-O-Bed international headquarters. Disc-O-Bed is a 22-year-old, privately-owned international company that manufactures a compact, transportable and stackable cot/bed system. They are headquartered in Duluth, GA, with their main manufacturing plant in Johannesburg, South Africa. They also have offices in Germany, China, Canada and Brazil.